The 96th day of the year; 96 is the smallest number that can be written as the difference of 2 squares in 4 ways. *What's So Special About This Number? Ninety Six, South Carolina. There is much confusion about the mysterious name, "Ninety-Six," and the true origin may never be known. Speculation has led to the mistaken belief that it was 96 miles to the nearest Cherokee settlement of Keowee; to a counting of creeks crossing the main road leading from Lexington, SC, to Ninety-Six; to an interpretation of a Welsh expression, "nant-sych," meaning "dry gulch." Pitcher Bill Voiselle of the Boston Braves was from Ninety Six, South Carolina, and wore uniform number 96.
hiding the light of the dazzling Sun; and sore fear came upon men." hiding the bright sunlight, and . . . fear has come upon mankind. After this, men can believe anything, expect anything. *Ted Pedas, Eclipse History web site. 1852, Edward Sabine announced that the 11 year sunspot cycle was "absolutely identical" with the geomagnetic cycle. Later, using a larger dataset, Rudolf Wolf confirmed this fact. Since Newton's explanation of the effect of the sun's gravity on earth, this was the first new phenomenon of the sun interacting with the earth. Thus began continuing studies of the solar-terrestrial activity. Sabine was an Irish geophysicist, astronomer, and explorer, who made extensive pendulum measurements to determine the shape of the earth, and established magnetic observatories to relate sunspot activity with disturbances in terrestrial magnetism. Sabine was knighted in 1869. 1929 To celebrate the centenary of the Death of Neils Henrik Abel, Norway issued a set of stamps in his honor. This is the first set of stamps honoring a mathematician in Philatelic history. 1938 DuPont researcher Roy Plunkett and his assistant, Jack Rebok, discovered polytetraﬂuoroethy­lene, the slipperiest man-made substance. Teﬂon became a household word in 1960 when Teﬂon-coated frying pans were introduced. The Manhattan Project used it in producing Uranium-235, for it was the only gasket material that would contain the corrosive hexaﬂouride. and learn with us what's Watson-Watt. 1972 Cray Research is an American supercomputer manufacturer based in Seattle, Washington. The company's predecessor, Cray Research, Inc. (CRI), was founded in 1972 by computer designer Seymour Cray. 1749 Samuel Vince (6 April 1749; Fressingfield – 28 November 1821; Ramsgate) was an English clergyman, mathematician and astronomer at the University of Cambridge. 1801 William Hallowes Miller (6 Apr 1801; 20 May 1880 at age 79) Welsh minerologist known for his Millerian indices built on his system of reference axes for crystals by which the different systems of crystal forms can be designated using a a set of three integers for each crystal face. When he published this scheme in A Treatise on Crystallography (1839), he provided an alternative to the existing confusion due to the many different descriptive systems previously in use. In his early career he published successful textbooks for hydrostatics and hydrodynamics (1831) and differential calculus (1833). Miller also prepared new standards in 1843 to replace the National Standards of weight and length that had been lost in the 1834 fire that destroyed the Parliament buildings. *TIS For an interesting story about how mathematics was related to the fire, read here. 1947 Michael Worboys (born April 6, 1947, ) is a British mathematician and computer scientist. He is professor of spatial informatics and director of the School of Computing and Information Science at the University of Maine. I love Abel's commet on Gauss' writing style, "He is like the fox, who effaces his tracks in the sand with his tail." 95and its reversal (59) begin fewer four-digit prime numbers (seven) than any other two-digit number. "What other conclusion shall we draw from this difference, Galileo, than that the fixed stars generate their light from within, whereas the planets, being opaque, are illuminated from without; that is, to use Bruno’s terms, the former are suns, the latter, moons, or earths?" In 1753, the British Museum was founded by an Act of Parliament granting £20,000 to purchase the 50,000 volume library of Sir Hans Sloane and his vast collection of 69,352 items of nature and art. Sloane was a prominent London physician who made the collection available in his will at much below its intrinsic value. Montagu House, Bloomsbury, was purchased in 1754 by the government to house this and other collections. Since it opened, on 15 Jan 1759, the Museum has been collecting, conserving and studying millions of artefacts. The British Museum established its Research Laboratory in 1920 with the appointment of Dr Alexander Scott as its first scientist. *TIS The myth that Sloan had invented the process of Hot Chocolate, which is still strongly promoted in the shops in Chelsea that feature this product, is a myth. See James Delbourgo's Article on Sloan and Cocoa here. Skipping to page 78 for details of the history of Chocolate in use around Europe in the 17th century. It had been used for much longer by the natives of South America with some apparent religious or spiritual relationship. 1800 A UFO sighting near Baton Rouge, Louisiana will be reported to the American Philosophical Society by Thomas Jefferson, President of the society, and (at that time) Vice-President of the United States. The report of a UFO by a Vice-President is still the highest government official to report a UFO. The report itself was written by the naturalist William Dunbar: "A phenomenon was seen to pass Baton Rouge on the night of the 5th April 1800, of which the following is the best description I have been able to obtain. It was first seen in the South West, and moved so rapidly, passing over the heads of the spectators, as to disappear in the North East in about a quarter of a minute. It appeared to be of the size of a large house, 70 or 80 feet long"
Einstein passed away on the 18th of that month, and the manifesto was released to the public on July 9th. 1656, Viviani edited the first edition of Galileo's collected works. He was a leader in his field and founded the Accademia del Cimento. As one of the first important scientific societies, this organization came before England's Royal Society. In 1639, at age 17, he became the student, secretary and assistant of Galileo (now blind) in Arcetri, until Galileo died in 1642. A note from Thony Christie informed me that after Galileo's death, his papers were being used by the local butcher to wrap his meat and sausages until Viviani rescued what was left of them. Viviani's Theorem is named for him. The theorem states that in an equilateral triangle, the sum of the perpendicular distances to the sides is equal to the altitude of the triangle. In the figure h=PE+PF+PG. If the point is outside the triangle, the relationship will still hold if one or more of the perpendiculars is treated as a negative value. The theorem can be generalized to a regular n-gon to state, for any point P interior to a regular n-gon, the sum of the perpendicular distances to the n sides is n times the apothem of the figure. 1911 Walter Warwick Sawyer (or W. W. Sawyer) (April 5,1911–February 15, 2008) was a mathematician, mathematics educator and author, who taught on several continents. Born in London, England , he attended Highgate School and was an undergraduate at St. John's College, Cambridge, obtaining a BA in 1933. He was an assistant lecturer in mathematics from 1933 to 1937 at University College, Dundee and from 1937 to 1944 at Manchester University. From 1945 to 1947, he was the head of mathematics at Leicester College of Technology. In 1948 W. W. Sawyer became the first head of the mathematics department of what is now the University of Ghana. From 1951 to 1956, he was at Canterbury College (now the University of Canterbury in New Zealand). He left Canterbury College to become an associate professor at the University of Illinois, where he worked from winter 1957 through June 1958. While there, he criticized the New Math movement, which included the people who had hired him. From 1958 to 1965, he was a professor of mathematics at Wesleyan University. In the fall of 1965 he became a professor at the University of Toronto, appointed to both the College of Education and the Department of Mathematics. He retired in 1976. W. W. Sawyer was the author of some 11 books. 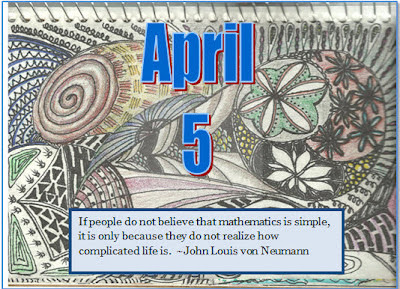 He is probably best known for his semi-popular works Mathematicians Delight and Prelude to Mathematics. Both of these have been translated into many languages. Mathematician's Delight was still in print 65 years after it was written. Some mathematicians have credited these books with helping to inspire their choice of a career. His first book "Mathematician’s Delight" (1943), was written with the aim "to dispel the fear of mathematics." It is one of the most successful math book ever written, going through numerous editions, translations into 10 languages, and selling more than 500,000 copies. "I enjoyed the mathematics that I had time to learn. I shall not be afraid to do so." In combinatorics, Bertrand's ballot problem is the question: "In an election where candidate A receives p votes and candidate B receives q votes with p > q, what is the probability that A will be strictly ahead of B throughout the count?" which Bertrand asked, and proved in 1887 in Comptes Rendus de l'Académie des Sciences. 2004 – Heiner Zieschang (12 November 1936 in Kiel – 5 April 2004) was a German mathematician. He was a professor at Ruhr University in Bochum from 1968 till 2002. He was a topologist. In 1996 he was an honorary doctor of University of Toulouse and in 1997 he was an honorary professor of Moscow State University. 2009 Irving John ("I.J. "; "Jack") Good (9 December 1916 – 5 April 2009) was a British mathematician who worked as a cryptologist at Bletchley Park with Alan Turing. After World War II, Good continued to work with Turing on the design of computers and Bayesian statistics at the University of Manchester. Good moved to the United States where he was professor at Virginia Tech. He was born Isadore Jacob Gudak to a Polish-Jewish family in London. He later anglicized his name to Irving John Good and signed his publications "I. J. Good." The 94th day of the year; 94!-1 is prime. The number 94!-1 ends in 21 consecutive nines. Students might inquire how they could have known this without being told. Add the prime factors of 94 and the result is 49, 94 reversed. 94 is the smallest even number greater than four which cannot be written as a sum of two twin primes. 1597 Galileo writes to Kepler, "....Like you, I accepted the Copernican position several years ago and discovered from thence the causes of many natural effects which are doubtless inexplicable by the current theories. I have written up many of my reasons and refutations on the subject, but I have not dared until now to bring them into the open, being warned by the fortunes of Copernicus himself, our master, who procured immortal fame among a few but stepped down among the great crowd (for the foolish are numerous), only to be derided and dishonored. I would dare publish my thoughts if there were many like you; but, since there are not, I shall forebear.... " *Giorgio de Santillana, The Crime of Galileo (1955). √5 fn = ((1 + √5)/2)n - ((1 - √5)/2)n.
The great event of the year was Philippa Garrett Fawcet's achievement in the Mathematical Tripos. For the first time a woman has been placed above the Senior Wrangler. The excitement in the Senate House when the lists were read was unparalleled. The deafening cheers of the throng of undergraduates redoubled as Miss Fawcett left the Senate House by the side of the Principal. On her arrival at the College she was enthusiastically greeted by a crowd of fellow-students, and carried in triumph into Clough Hall. Flowers, letters, and telegrams poured in upon her throughout the day. The College was profusely decorated with flags. In the evening the whole College dined in Clough Hall. After dinner toasts were proposed: the healths drunk were those of the Principal, Miss Fawcett, her Coach (Mr Hobson) and Senior and Junior Optimes. At 9.30 p.m. the College gardens were illuminated, and a bonfire was lighted on the hockey-ground, round which Miss Fawcett was three times carried amid shouts of triumph and strains of "For she's a jolly good fellow." This blog from the Smithsonian has some nice detail about her. 1617 John Napier of Merchiston (1550 – 4 April 1617) – also signed as Neper, Nepair – named Marvellous Merchiston, was a Scottish mathematician, physicist, astronomer & astrologer, and also the 8th Laird of Merchistoun. He was the son of Sir Archibald Napier of Merchiston. John Napier is most renowned as the discoverer of the logarithm. Napier is the inventor of the so-called "Napier's bones". Napier also made common the use of the decimal point in arithmetic and mathematics. Napier's birthplace, the Merchiston Tower in Edinburgh, Scotland, is now part of the facilities of Edinburgh Napier University. After his death from the effects of gout, Napier's remains were buried in St Cuthbert's Church, Edinburgh. His work, Mirifici Logarithmorum Canonis Descriptio (1614) contained fifty-seven pages of explanatory matter and ninety pages of tables of numbers related to natural logarithms. The book also has an excellent discussion of theorems in spherical trigonometry, usually known as Napier's Rules of Circular Parts. Modern English translations of both Napier's books on logarithms, and their description can be found on the web, as well as a discussion of Napier's Bones (see below) and Promptuary (another early calculating device). His invention of logarithms was quickly taken up at Gresham College, and prominent English mathematician Henry Briggs visited Napier in 1615. Among the matters they discussed was a re-scaling of Napier's logarithms, in which the presence of the mathematical constant e (more accurately, the integer part of e times a large power of 10) was a practical difficulty. Napier delegated to Briggs the computation of a revised table. The computational advance available via logarithms, the converse of powered numbers or exponential notation, was such that it made calculations by hand much quicker. The way was opened to later scientific advances, in astronomy, dynamics, physics; and also in astrology. Napier made further contributions. He improved Simon Stevin's decimal notation. Arab lattice multiplication, used by Fibonacci, was made more convenient by his introduction of Napier's bones, a multiplication tool using a set of numbered rods. He may have worked largely in isolation, but he had contact with Tycho Brahe who corresponded with his friend John Craig. Craig certainly announced the discovery of logarithms to Brahe in the 1590s (the name itself came later); there is a story from Anthony à Wood, perhaps not well substantiated, that Napier had a hint from Craig that Longomontanus, a follower of Brahe, was working in a similar direction. Napier used his rooster to determine which of his servants had been stealing from his home. He would shut the suspects one at a time in a room with the bird, telling them to stroke it. The rooster would then tell Napier which of them was guilty. Actually, what would happen is that he would secretly coat the rooster with soot. Servants who were innocent would have no qualms about stroking it but the guilty one would only pretend he had, and when Napier examined their hands, the one with the clean hands was guilty. Another occasion which may have contributed to his reputation as a sorcerer involved a neighbor whose pigeons were found to be eating Napier's grain. Napier warned him that he intended to keep any pigeons found on his property. The next day, it is said, Napier was witnessed surrounded by unusually passive pigeons which he was scooping up and putting in a sack. The previous night he had soaked some peas in brandy, and then sown them. Come morning, the pigeons had gobbled them up, rendering themselves incapable of flight. 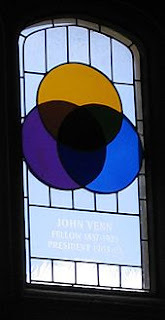 1923 John Venn FRS (4 August 1834 – 4 April 1923), was a British logician and philosopher. 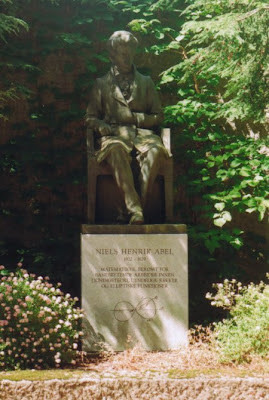 He is famous for introducing the Venn diagram, which is used in many fields, including set theory, probability, logic, statistics, and computer science. Leibniz was the ﬁrst to systematically use geometric diagrams to represent syllogisms, and Euler developed the ideas, but Venn gets the credit for his book popularized them. *VFR He was a fellow of Gonville and Caius and there is a stained glass window memorial there in the dining hall, which I had the pleasure of visiting with Professor Anthony Edwards. Carl Ludwig Siegel (December 31, 1896 – April 4, 1981) was a mathematician specializing in number theory and celestial mechanics. He was one of the most important mathematicians of the 20th century. A potato can be cut into 93 pieces with just nine straight cuts. 1736 Euler replied to Ehler on Konigsberg Bridge Challenge, "Not a Mathematical Problem..."
1763 Easter Saturday 1763, Lalande recorded that the Astronomer Royal Nathaniel Bliss said ‘that Mr Lemonnier attached the wire to his quadrant with wax from his ears, that he went to Oxford with his sword broken, and that his observations agree less well with those of Mr Bevis than those of Caille.’ Pierre Charles Lemonnier or Le Monnier was a talented French astronomer 17 years Lalande’s senior who had a penchant for British instruments and astronomical methods and was a member of the Royal Society and the French Academy of Sciences. *Royal Museum Greenwich blog "MEOW!" In 1934, a British patent application for the first catseye road marker was recorded for inventor Percy Shaw (1889-1975), described as "Improvements relating to Blocks for Road Surface." These are the familiar reflectors which mark the lines that are lit up at night by the lights of passing vehicles. The raised surface in which the reflectors are mounted have a construction that "will yield when traveled over by a vehicle wheel and sink to the level of the road surface" such as a resilient white rubber cushion mounted in a metal holder sunk below the road surface. The patent No. 436,290 was accepted 3 Oct 1935. A revised design was patented the following year as No. 457,536. Shaw started Reflecting Roadstuds Ltd. to manufacture them. *TIS (While this is of little mathematical interest, before I learned what the term meant, I regularly wondered about a sign I passed on the way from Stoke Ferry to King's Lynn in Norfolk Shire which said, "Cat's Eyes Removed Ahead." 2016 First day of the major league baseball season. The exact width of home plate is irrational: 12 times the square root of two. History: The plate was originally a circle of diameter one, then a square of the same size(! ), which, by mistake was a one-by-one square. Then the corners were filled in to make the current pentagonal plate. *VFR Home plate is an irregular pentagon. The front is 17 inches wide, faces the pitcher, and defines the width of the strike zone. Then parallel sides 8.5 inches long connect to the foul lines. Finally 12 inch sides run down the foul lines, connecting where the foul lines meet. 1529 – Michael Neander (April 3, 1529 – October 23, 1581) German mathematician and astronomer was born in Joachimsthal, Bohemia, and was educated at the University of Wittenberg, receiving his B.A. in 1549 and M.A. in 1550. 1835 John Howard Van Amringe (3 April 1835 in Philadelphia, Pennsylvania, USA - 10 Sept 1915 in Morristown, New Jersey, USA) was a U.S. educator and mathematician. He was born in Philadelphia, and graduated from Columbia in 1860. Thereafter, he taught mathematics at Columbia, holding a professorship from 1865 to 1910 when he retired. Van Amringe was also the first Dean of Columbia College, the university's undergraduate school of arts and sciences, which he defended from dismemberment and incorporation into the larger university. During his long presence at the school, he made many addresses and enjoyed unrivaled popularity. He is memorialized with a bust enshrined in a column-supported cupola on "Van Am Quad" in the southeastern portion of the campus, surrounded by three College dormitories (John Jay Hall, Hartley Hall, and Wallach Hall) and by the main College academic building, Hamilton Hall. He is buried in Greenwood Cemetery in Brooklyn. Van Amringe served as the first president of the American Mathematical Society between 1888 and 1890. 1900 Albert Edward Ingham (3 April 1900–6 September 1967) was an English mathematician. His book On the distribution of prime numbers published in 1932 was his only book and it is a classic. Many of the ideas here, as in other work of Ingham's, came from the joint work undertaken by Harald Bohr and Littlewood. 1907 Mark Grigorievich Krein (3 April 1907 – 17 October 1989) was a Soviet Jewish mathematician, one of the major figures of the Soviet school of functional analysis. He is known for works in operator theory (in close connection with concrete problems coming from mathematical physics), the problem of moments, classical analysis and representation theory. He was born in Kiev, leaving home at age 17 to go to Odessa. He had a difficult academic career, not completing his first degree and constantly being troubled by anti-Semitic discrimination. His supervisor was Nikolai Chebotaryov. He was awarded the Wolf Prize in Mathematics in 1982 (jointly with Hassler Whitney), but was not allowed to attend the ceremony. 1472 Leone Battista Alberti (18 Feb 1404 in Genoa, French Empire (now Italy)- 3 April 1472 in Rome, Papal States (now Italy) The date of his death is given by Wikipedia as April 20, 1472) Italian mathematician who wrote the first general treatise on the laws of perspective and also wrote a book on cryptography containing the first example of a frequency table. Alberti died in Rome, but his ashes were brought from Rome and put in the family vault in the Santa Croce Cathedral (where Galileo is buried). 1827 Ernst Florenz Friedrich Chladni, physicist and amateur musician, died. He is best remembered for the spectacular symmetrical patterns formed when a sand covered plate is vibrated with a violin bow. He was a Professor of Physics in Breslau when he developed Chladni figures c1800. He came to Paris in 1808 to present his work at the Institut and Laplace had him give a two hour demonstration to Napoleon, who gave him 6000 francs. She also received the De Morgan Medal of the Society in 1968. In 1969 she received the distinction of being honoured by the Queen, becoming Dame Mary Cartwright, Dame Commander of the Order of the British Empire.